Some day I shall cook polenta the way it was mean to be cooked. The way Bill Buford describes it being cooked in Heat . I’m the kind of person where once I read something, I can’t get it out of my head. So, when I read Heat and learned that you should never ever use instant polenta, I started frantically wondering what I’d do with my package of instant polenta in the pantry. Throw it away? Keep it until it spoiled? Use it and not tell anyone? Shhhh. But then I remembered. We are not Martha. Nor are we Bill Buford. Nor Mario Batali. And guess what? Even though, Batali taught Buford to never use instant polenta, he still recommends it in all of his recipes. Because it’s the easy thing to do. And sometimes easy is good. Especially when you’re looking for a quick and simple appetizer. Like I was. It asked: You wouldn’t knowingly stick your hand in an active volcano, would you? Of course not, I answered. Go away, then, it said. Do something else. 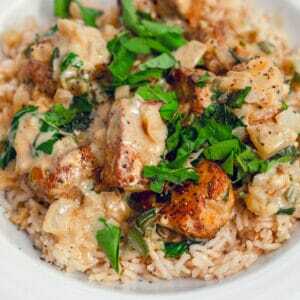 I am not temperamental like risotto. Go on: cook the rest of dinner. Now I know one thing for sure, instant polenta never speaks to me. But simply letting polenta bubble and do its thing on the stove without having to keep constant guard? Even I can handle that. But when you don’t have the time and are simply making polenta rounds (and not a big bowl of comfort in the form of polenta), I think instant is just fine. Everyone will just be happy you’re not using polenta from a tube. Baby steps here. So, like you probably gathered, if you’re using instant polenta, it’s super duper easy and quick. Simply bring the chicken broth and milk to a boil in a large saucepan. 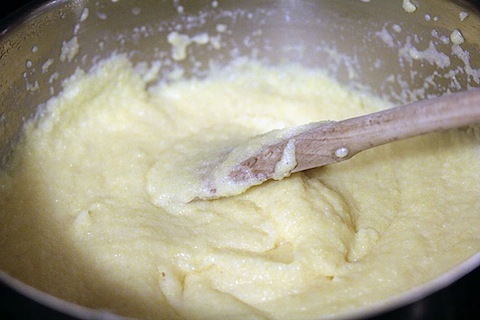 Whisk polenta in to the liquid and immediately turn down the heat to low. Cook polenta for about 3 minutes, stirring it a bit. Mix in parmesan cheese. Add in some salt and pepper, too. 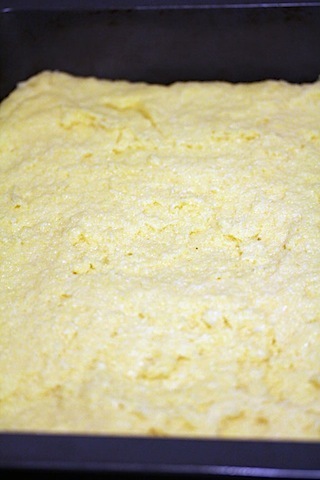 Immediately pour polenta into 9 x 13 pan and let sit for about 3 hours to firm up. I made my polenta the night before and covered it well before hitting the hay. Now, onto the toppings. Caramelize your onions with 1/2 T butter and the brown sugar over medium heat. 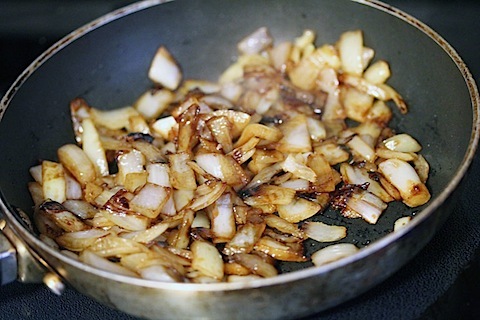 Caramelizing onions is one of my very favorite things to do, no lie. There’s just something about it that makes me feel so comfortable. Happy. 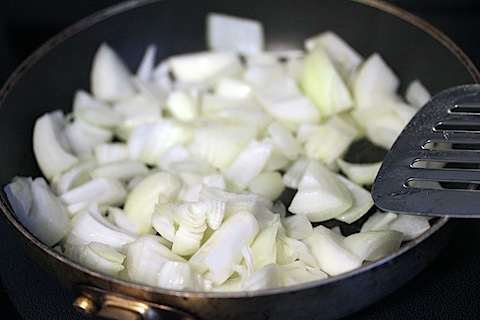 Stir every now and then until onions are browned. 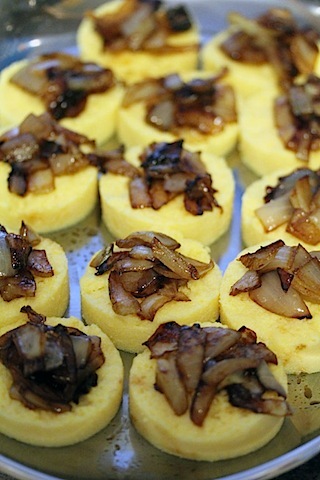 While your onions are caramelizing, cut rounds out of your polenta. I used a biscuit cutter with 2.5″ diameter, but think the rounds might have been even better if they were a bit smaller. Bite-sized! 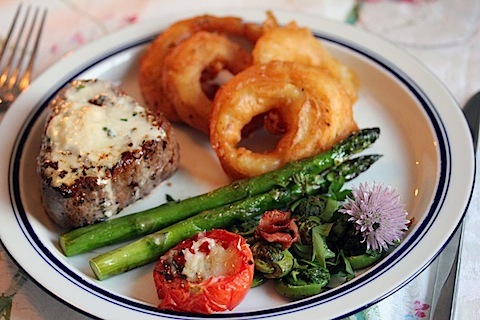 Arrange your rounds on a serving dish. I used the Wilton Armetale tray my Aunt Judy and Uncle Hal gave me and it was perfect because I could stick the entire tray in the oven. 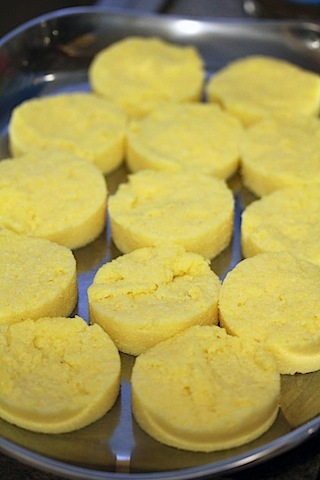 You could also put your polenta rounds on a cookie sheet for now, until serving. 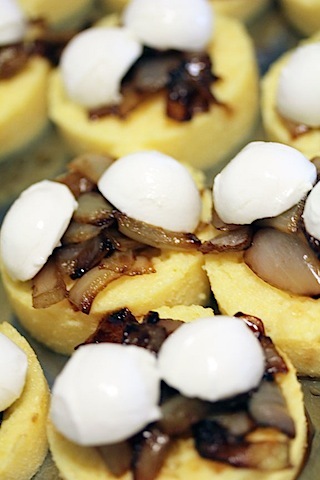 When the onions are done, layer them on top of the polenta rounds. 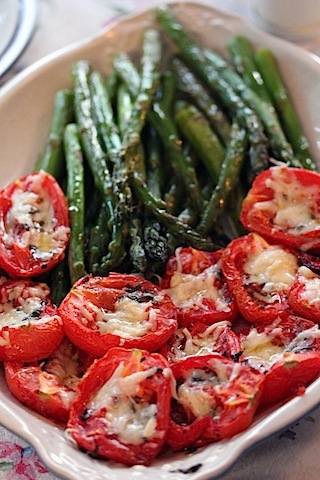 Then top with mozzarella. I used little mozzarella balls, so I simply halved them and put two halves on each polenta bite. At this point, I stuck the tray in the oven (at a low temperature) to melt the cheese a little bit. This is totally optional. Then I layered some prosciutto on top. Yum. Some of my very favorite things all hanging out together. Does life get any more beautiful than that? And that’s all there is to it. I traveled with these to my parents’ house, so before serving, I stuck them back in the oven to warm them up again. You can make polenta rounds and layer them with literally anything you choose. 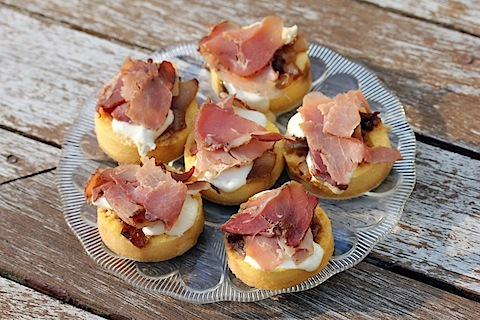 But I’m pretty sure caramelized onion, mozzarella, and prosciutto is the perfect combination. Everyone enjoyed these little appetizers and I see a lot more polenta in my future. 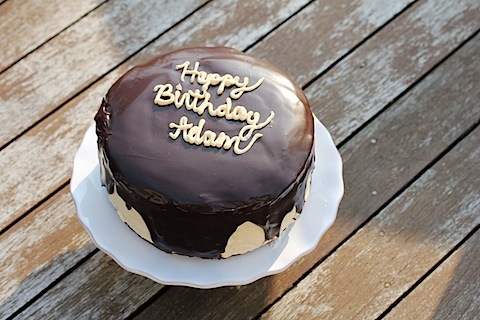 We went to my parents’ house to celebrate my brother-in-law, Adam’s, birthday. 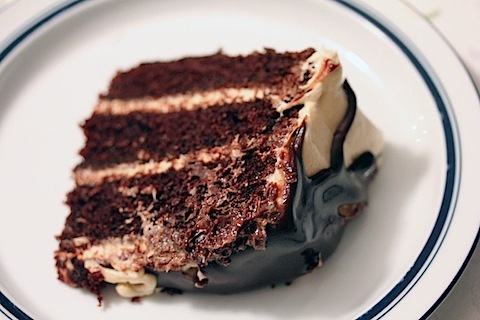 I made the appetizer and my sister made this absolutely amazing peanut butter chocolate cake. It was seriously heavenly. The recipe came from Smitten Kitchen and I encourage you all to try it out if you have any chocolate and peanut butter fans in your life. I’ve got lots of them. I am one. 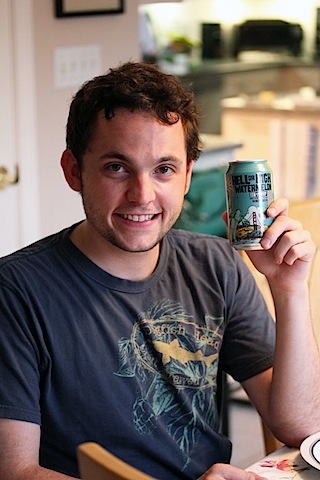 In addition to Adam’s birthday, Chris was celebrating the fact that it’s finally time to drink one of his favorite beers again. Hell or High Watermelon from 21st Amendment Brewery. 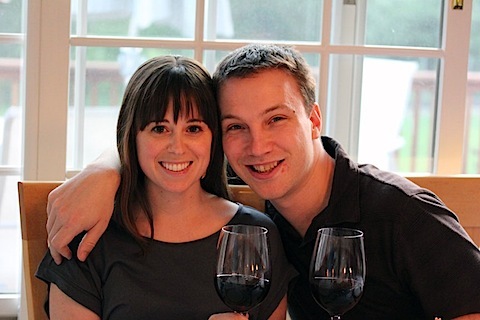 The birthday boy and his wife! If you could top your polenta rounds with anything, what would it be? 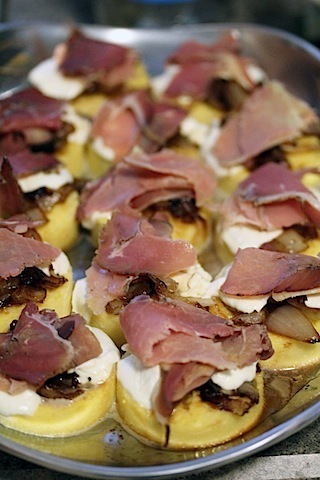 35 Responses to "Polenta Rounds with Caramelized Onion, Mozzarella, and Prosciutto"
Um, any chance your mom might like to do a guest post and show us how to make those onion rings? Because….yum. oh, golly. watermelon beer. i’m obsessed. also– i’m like the ONE vegetarian that doesn’t love polenta. but with caramelized onions, everything is good. on the list! Now i see great cooking runs in your family! This looks like a fantastic meal! And I adore Heat! Wow…so many of my favorite things on that polenta!!! I will definitely have to make that. oh and when I’ve made polenta in the past I’ve cheated even more and bought the pre cooked ones. I’ve topped out with cheese and.sauce and made little pizzas! 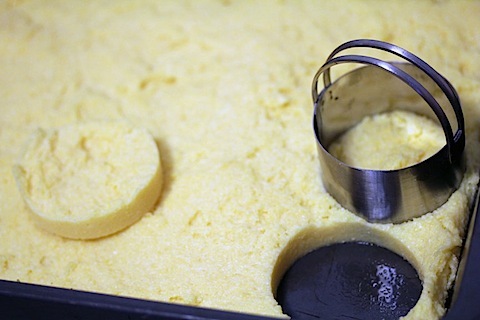 I love polenta…thanks for the recipe! I actually have yet to cook with polenta bc my husband doesn’t like it, but I’m thinking this recipe might just win him over! These look awesome! I don’t cook polenta often, but I really enjoy it… so I see these rounds being made in the not-too-distant future. The whole meal looks fantastic. I love how everyone contributed a dish! You certainly do have a culinarily-inclined family :). What an amazing spread! 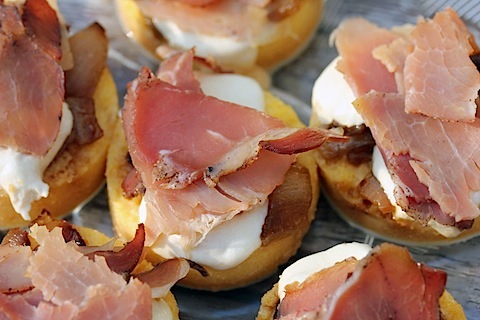 The polenta rounds look like the perfect bite. I love that watermelon beer too! I don’t know what the Top Chef ruling on this is, but I used to do polenta in a slow cooker sometimes. It wasn’t like my Italian grandmother used to make, but I thought it was pretty darn tasty in a bowl with some salt and butter. 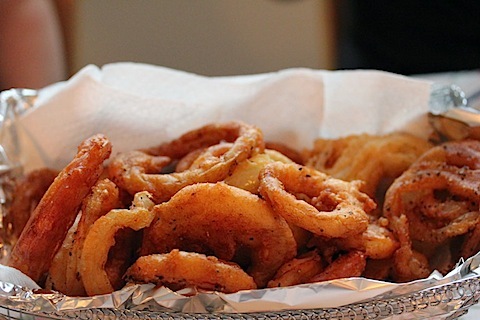 It should be illegal for you to post pictures that look so absolutely mouth-watering. I must make these immediately! Maybe with a little marinara sauce, since I like things to be overly saucy at all times. Yum! Wow! The entire spread looks AMAZING! 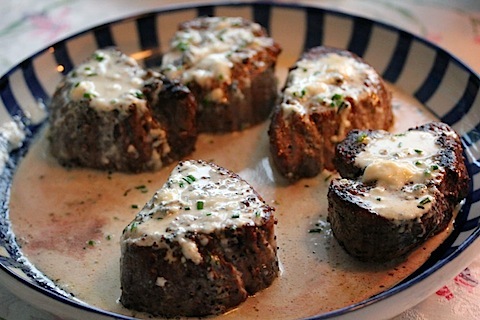 I’d love the recipe for that blue cheese cream sauce on the steak! thats is a serious birthday dinner, and dessert. your fam goes all out and I love that!! Easy can definitely be good and I love what you’ve done here! Also, I want to have dinner at your parent’s house. You guys know what you’re doing! That seriously is the best meal ever. Yum! 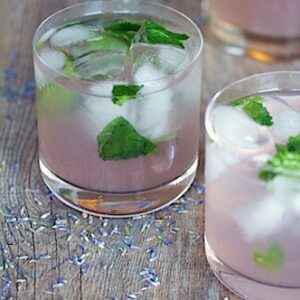 We want that meal at Lake Chautauqua this summer……………I’ll make the drinks! That meal looks awesome! What an array of styles and flavors. 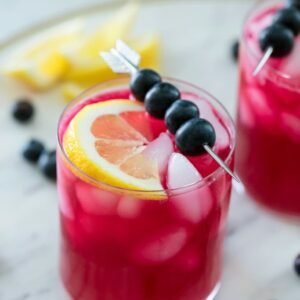 Love those apps, will have to remember them for my next cocktail party – looks like a perfect bite! fabulous – all of it! Yum! 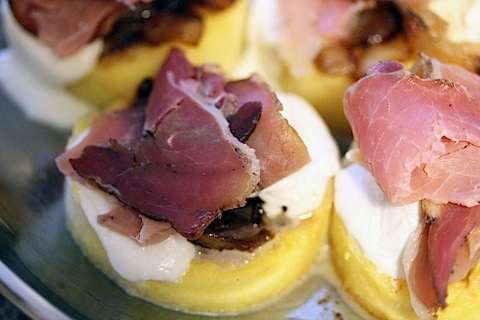 Polenta rounds are a very creative appetizer, especially topped with those goodies. 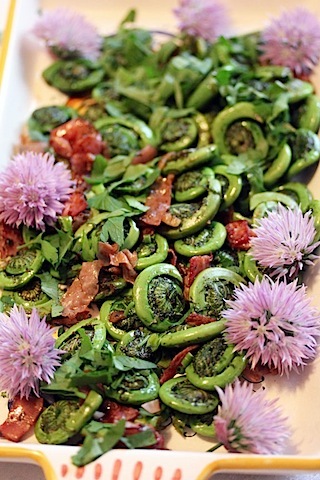 Love the fiddleheads, too! I’ve spied that Smitten Kitchen cake before and it looks too dangerous to attempt. Those look so good! 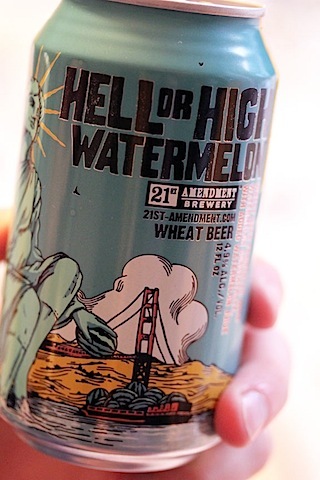 I tried Hell or High Watermelon for the first time this weekend in SF… it’s AMAZING! Where do you get it around here? I’ve never seen it before! Your polenta blurb was awesome. Instant is the way to go for me, too! Having it topped with marinara and parm is what I’d like. Your’s are so creative! Oh, and that cake? YUMS! @Tara- I’ve seen Hell or High Watermelon lots of places around here recently! I know that the Meat House in Brookline has it, as does Craft Beer Cellar in Belmont. Isn’t it the perfect summer beer??! Instant polenta will do the trick just fine! You guys had a great dinner with family. Looks like everyone enjoyed the meal. 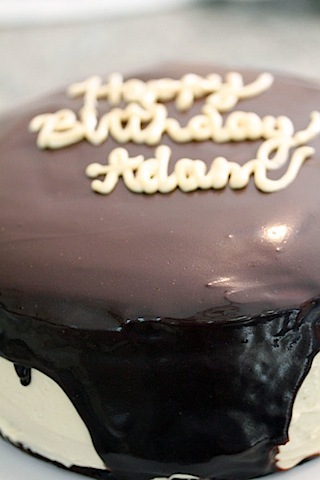 i LOVE that cake. and i’ve never actually had real polenta… in fact, i might try this app with polenta in the tube 🙂 all class!! 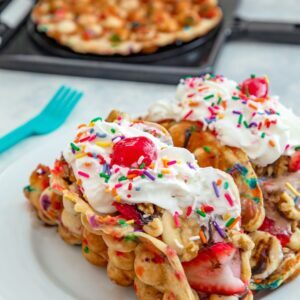 We did a polenta breakfast dish once that was topped with all sorts of goodies, but this looks amazing! 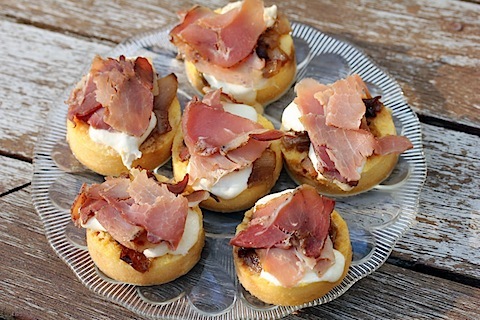 And the fact that is has prosciutto with it? fabulous. I’m going to look for that cake immediately. i seriously need all of this in my life (and in my stomach) right now! yum! I’ve never had polenta, nor am I 100% certain what it is. But these look really good! I’m trying to find a good appetizer to bring to my cousin’s grad party. 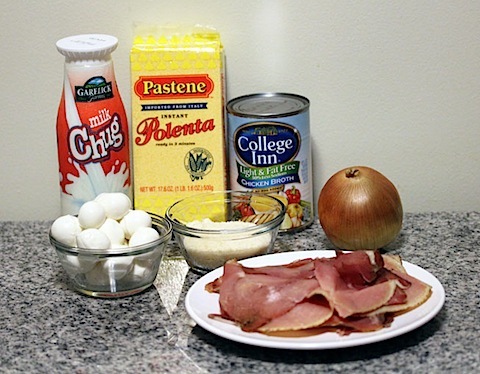 Perhaps I’ll try these… the rest of the meal looks sooo good too! I’ve never tried making polenta, but I would much rather make than use from a package. I’d be ok with instant polenta. 🙂 3 hrs is a long time! I’ll be honest, although I love polenta and I’ve had it many times, I’ve never actually made it myself. Maybe I will have to rectify that with these yummy little bites!! Saw your blog listed to attend TechMunch in July! Clicked through and immediately fell in love! Watermelon beer from 21st Amendment, fiddleheads, teaching how to make polenta… I am HOOKED! Wow! INCREDIBLE! going to steal the Polenta recipe! Amazing dinner – what a nice family!